Why is my 'Send From' address different than my 'Reply To' address? If you created your Cerkl account with a 'yahoo.com', 'aol.com', 'rocketmail.com', or 'gmail.com', your 'Reply To' address and 'Send From' address will not be the same. 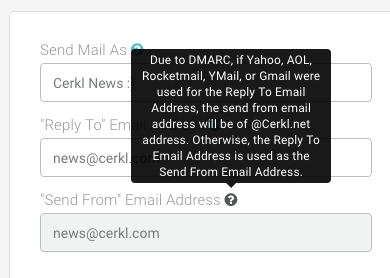 If any of the above email extensions were used as the 'Reply To' email, due to DMARC, the 'Send From' address will be of @Cerkl.net address.